Ah, Switzerland. The land of chocolate, cow-bells, skiing and prices that make you want to cry. A place that has built a global brand on providing a safe, risk-free haven for other people’s money and not being disruptive or belligerent. Clean, orderly and wonderfully peaceful — yes, the clichés are true. Not then, you might think, a country especially suited to launching a startup — but you’d be wrong. Long a hub for high-tech and medical sciences, Switzerland now boasts an ecosystem of Internet entrepreneurs that’s blossoming as fast as the proverbial Edelweiss in spring. “I don’t know any other country on Earth that is so good at seed funding,” enthuses Johannes Reck, co-founder and CEO of GetYourGuide. His story is illuminating — after founding GetYourGuide in 2008, his team was approached by a local bank with a seed funding offer, an out of the blue reversal of roles that typifies what’s happening here. Liquid Metal Battery Corporation, an MIT spin out that’s developing new technologies for electricity storage, has raised $15 million in funding from Khosla Ventures, Total and Microsoft co-founder Bill Gates. The technology behind the company was developed by Dr. Donald Sadoway (his famous TED Talk), a professor at the Massachusetts Institute of Technology who was recently named one of Time Magazine’s 100 Most Influential People in the World. Bill believes that creating large-scale batteries to store energy is a critical problem to solve if solar and wind energy are to become mainstream. In this video, Bill and MIT Professor Donald Sadoway discuss the importance of new battery storage technology and Sadoway’s focus on the development of a “liquid metal” battery. Etsy has closed $40 million of funding from a roster of investors who have been believers in Etsy for a long time. I couldn’t be happier to have such a committed set of partners who “get it” along for the next stage. Almost four years later, many things have changed. We have different offices near the Brooklyn Bridge, a working elevator, almost 300 employees, and last month alone, the community sold about $65 million in goods. Each month, 40 million people around the world visit Etsy, with 15 million registered members and 875,000 sellers generating those sales in 150 countries. We believe, more than ever, that Etsy can help fundamentally change the way the world works by making it possible for individuals to make and sell things to other people around the globe — a people-powered economy. Decades of an unyielding focus on economic growth and a corporate mentality has left us ever more disconnected with nature, our communities, and the people and processes behind the objects in our lives. We think this is unethical, unsustainable, and unfun. However, with the rise of small businesses around the world we feel hope and see real opportunities: Opportunities for us to measure success in new ways… to build local, living economies, and most importantly, to help create a more permanent future. 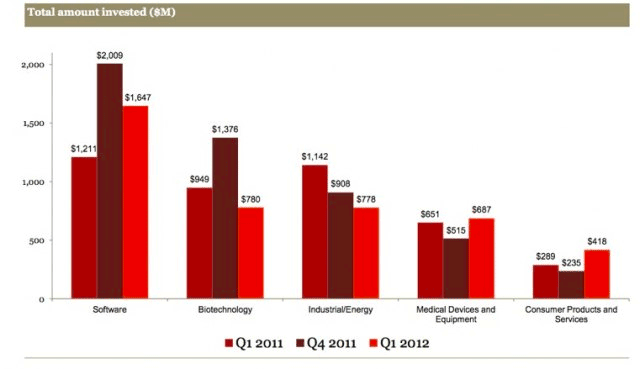 Venture capitalists invested $5.8 billion in 758 deals in the first quarter of 2012. The report shows that after a strong fourth quarter 2011, VC investment activity for the quarter fell 19 percent in terms of dollars and 15 percent in the number of deals compared to the fourth quarter of 2011 when $7.1 billion was invested in 889 deals. Double-digit percentage increases in the Consumer Products and Services, and Telecommunications industries. Kickstarter is having an amazing year, even by the standards of other white hot Web startup companies, and more is yet to come. (The Start-up) is on track to distribute over $150 million dollars to its users’ projects in 2012, or more than entire fiscal year 2012 budget for the National Endowment of the Arts (NEA), which was $146 million.